These are fragments on a wall panel, at the east end of the south aisle. This is dated to the early ninth century. 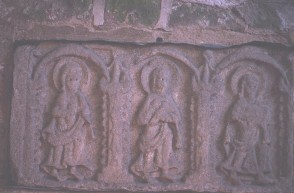 The three figures on the left of Mary are haloed, their hair is long, and they are dressed identically. Two of them may be carrying scrolls and the other is carrying a book. Cramp, Rosemary J., , ‘Schools of Mercian sculpture’. In Mercian Studies (1977) 191-233. Dornier, A., Mercian Studies 1st, Leicester U.P., Leicester (1977) .